Welcome to the June Virtual Book Club for Kids! This month, our spotlight author is Gail Gibbons. One of the reason I LOVE participating in the virtual book club, is that I am always learning about new-to-me authors, and Gail Gibbons is one of them. Turns out, she has been around a WHILE and has written a TON of books! As in, over 170 of her books that she has written and illustrated have been published! What sets Gail Gibbons apart from other children’s authors I am most familiar with, is that she is a nonfiction writer! So her books are informative and your children can learn some pretty cool things. 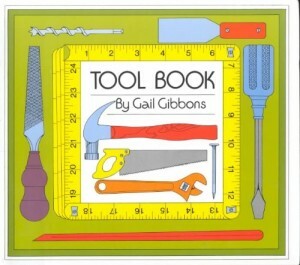 Gail Gibbon’s Book Tool Book is a really simple book that has pictures of all sorts of different tools and what they are used for. Basically, Gibbons provides pictures of tools within different categories based on their use. This keeps the words limited and the language pretty simple. One of the reasons I really like Tool Book , is the simplicity. There are very few words and lots of pictures of various tools. Why do I love the simplicity? Believe it or not, sometimes the books with the least amount of words can provide the MOST opportunities for speech and language opportunity! This is why, many of us speech-language pathologists LOVE wordless books. Our Activity: Get Out the Tools! My son LOVES his tools, and actually so does my daughter! 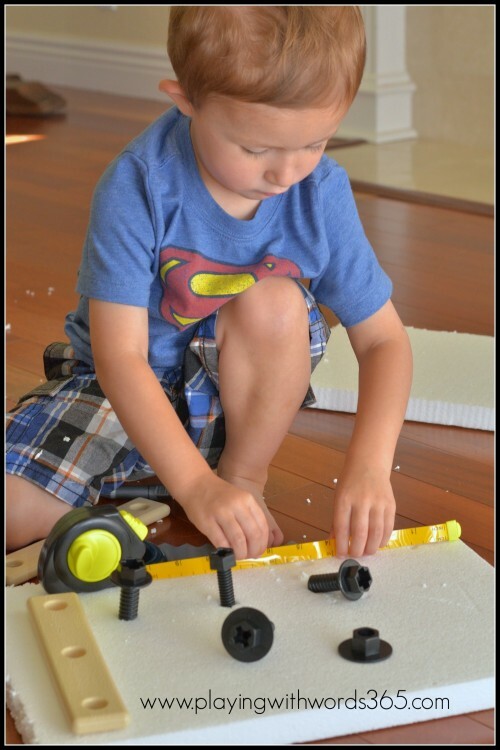 They have a ton of fun playing with our tool set and “fixing” and “building” things. 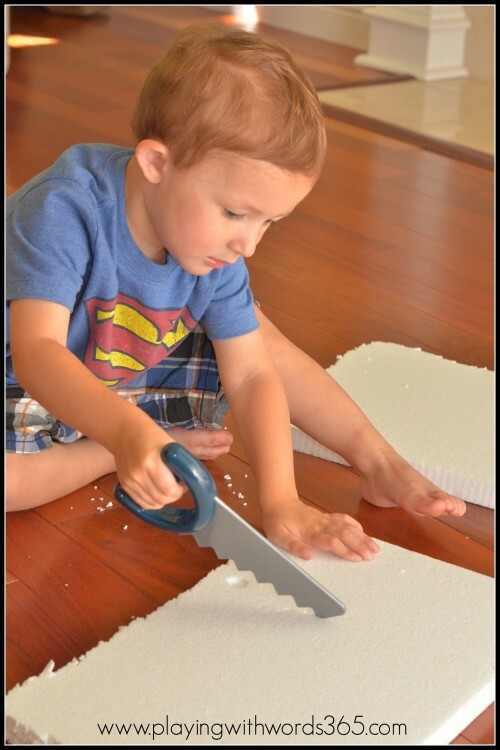 A favorite activity around here, when we have it on hand, is to get out the tools and drill, cut, measure and “build” with styrofoam! Is it messy? Yup. But pretty easy to clean up after really (in fact, my daughter likes to clean up using the vacuum). I basically just give the kids each a couple pieces and let them go to town. 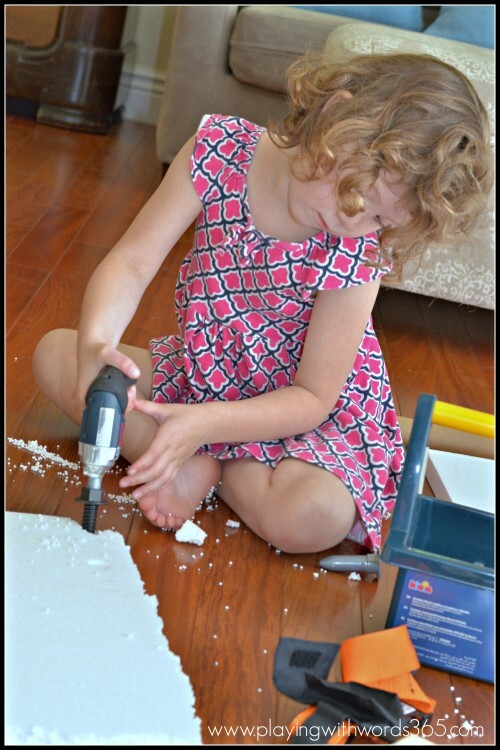 My daughter REALLY loves using the drill to drill holes. You can also have them hammer in nails, “cut” with the saw, twist in screws, and measure things. One of the great things about this activity, is that it keeps my kids busy for a long time. 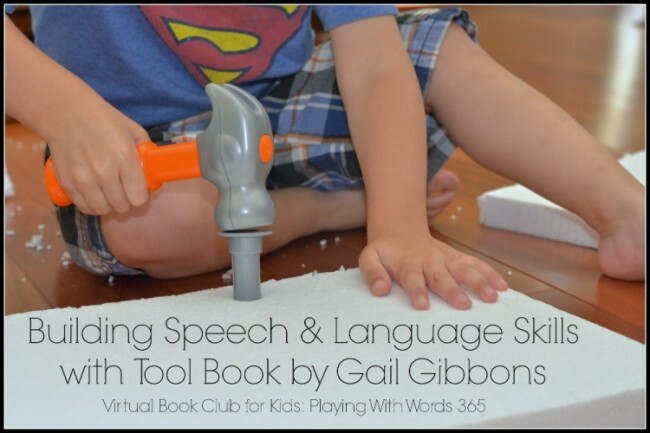 Vocabulary you can emphasize/target during reading: tools, build, wood/lumber, window, tree, work, measure, together/apart, cut, scrape, pound/hit, grip, holes, screws, nails, nuts bolts, lift, surface, tool box, workbench, plus all the names of the tools included in the book. I mentioned that there are not a lot of words in the book. This is a nonfiction book, so it is more informative (no “story”). As you go through the book, you can expand on the pictures/language based on the level of your child. For example, for my daughter (4.5) we talked a lot about what each tool does and how we can use them. For her, I used a lot of language because that is where she is. For my son (2.5) who happens to also be a late talker (the irony), I simplified my language a bit for him and avoided a lot of questions that he cannot answer. For him, I did more expanding on the language already there, where as with my daughter, I asked her questions to get her talking so we could have conversations around the items in the book that she found most interesting. Words you can emphasize/target during this play: drill (noun), hammer, measuring tape, screw, nail, cut, twist, hit/bang, in, on, out, drill (verb), measure, etc. Looking for more great learning ideas to go along with Gail Gibbons’ books? Check out all these awesome ideas below! So many great language tips. My kids would love this activity too! I will need to go and find some styrofoam. It is such a cool material to play with and I love the idea of using tools with it! I am really enjoying learning about all of these great non-fiction books! Thanks Kristina! With the recent move, we’ve had a lot of styrofoam on hand, so it has been a recurring activity around here! And yes, I have been loving these nonfiction books also!